201 Dome Mosque (২০১ গম্বুজ মসজিদ/দুইশ এক গম্বুজ মসজিদ) (also known as 201 Gombuj Mosque, 201 Gombuj Masjid, Duisho-Ek Gombuj Masjid) is being constructed beside Jhinai river in south Pathalia village under Jhauwail union of Gopalpur upazila in Tangail District, Bangladesh. It will be the first mosque with the highest number of domes. The construction has been started of this mosque in January of 2013. After completion of the construction, about 15000 Muslims can say their prayers at a time in the mosque. Architectural Features: The mosque will not be only featured with 210 domes. There will be more architectural features and it will really be an eye-catching in the history of religious building in the world. According to the architectural plan, the entire Holy Quran will be written in the west wall of this mosque. There will be one main dome in the middle of the roof with about 81 feet and other 200 domes will be 17 feet each. Apart from the there will be 4 minarets in the four corners of the mosque. Each of these minarets will be about 101 feet high. 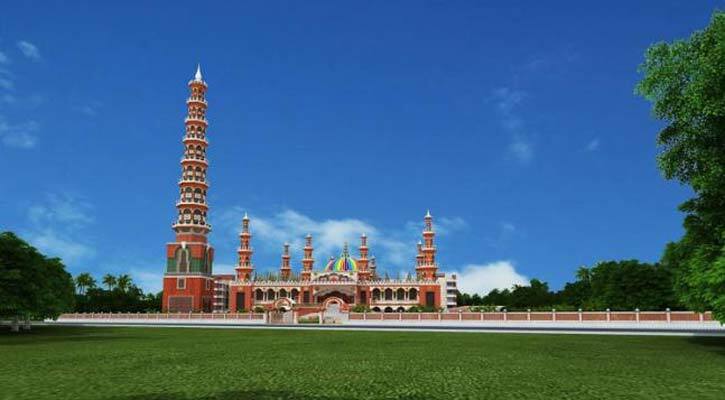 To announce Azan, there will be 451 feet high minaret. According to the highest, this will be the highest minaret of Bangladesh and second highest brick build minaret in the world. Inside the mosque area, there will be separate buildings of beside the main mosque. These buildings will be considered as orphanage, elder’s home and modern hospital. There will also be a helipad for foreigner. The estimated cost to complete this mosque is about 100 crore of Bangladeshi taka. The construction will be ended by 2017. After completion of this mosque, it will be one of the main attractions to the Muslim from entire world. Not only that, it will also attract numerous number of tourists from Bangladesh and abroad. This mosque will surely add an extra milestone in tourist attractions of Bangladesh. How to go: If you want to visit the mosque, you have to go Tangail by bus or train. And then you need to go Jhauwail Union of Gopalpur Upazila. Address: Pathailia, Jhauwail union, Gopalpur, Tangail, Bangladesh.